RARE RUTH!!! No advanced baseball card collection could possibly be considered complete without a standout card of the immortal George Herman Babe Ruth. The "Sultan of Swat" is undoubtedly baseball's greatest player ever, majestic in every aspect to the point where he is actually considered "above the game" itself. 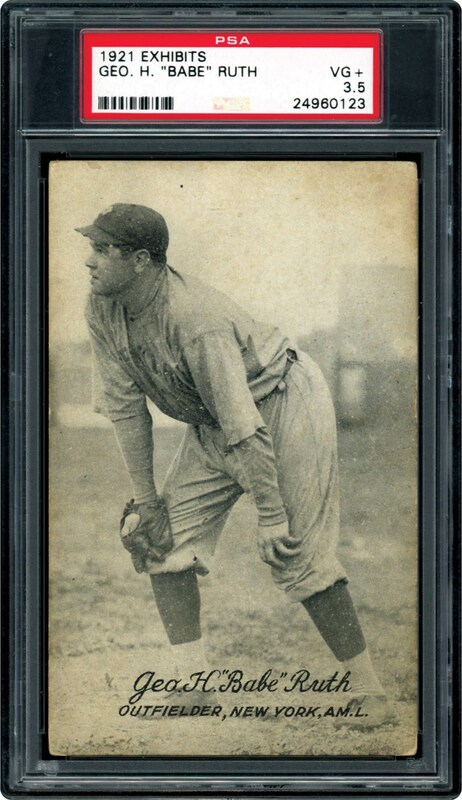 Every avid card enthusiast seeks his high end cardboard artifacts and none could be more impressive than this 1921 Exhibit Babe Ruth offering in a superb PSA 3.5 holder. What significantly prompts collectors' attention to this card is that it is one of Ruth's earliest cards portraying him in a Yankee uniform as well as in a fielding position. Traded to the Yankees in 1920, only his 1920 "Headin Home" movie lobby cards and some rouge strips precede this 1921 card depicting the "Bambino" donning his classic Yankee pinstripes (the 1921 Oxford Confectionary also depicts Ruth in a Yankee uniform). 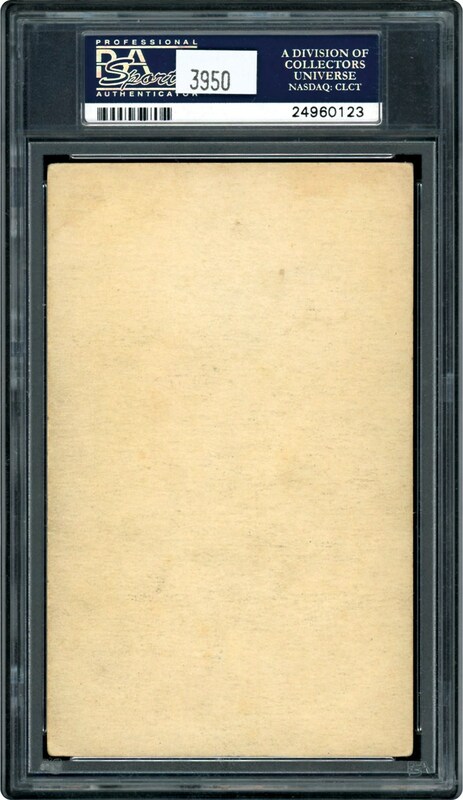 Additionally, all Babe Ruth cards either utilize a batting, pitching or portrait image of the great "Bambino". No other Ruth issues that we can recall place Ruth in his outfield position, with this black & white image providing superior contrast of Ruth in his grandeur "hands on knees" pose. Nor do many other Ruth cards provide his full name with the "Geo. H. "Babe" Ruth" text situated by his spikes portraying brilliant registration. The four relatively clean corners and nice edging form a VG+ perimeter, with the final compliment being a somewhat clean toned verso. From an overall aesthetics perspective, this is a strong offering of this baseball giant who's diamond exploits will unquestionably outlast eternity!